Please read the below comments. As you all know by now, the City of New Orleans voted to remove the Confederate monuments from the city on a “nuisance complaint.” This isn’t over, so do not overreact to the situation. A lawsuit seeking to permanently enjoin and prevent the removal of the Confederate monuments was filed in federal court only hours after the vote was taken in the city council. The federal judge has let everyone know to cool it for now. There will be a hearing in January with the New Orleans City Attorney and the attorney for the plaintiffs present and an injunction will be decided after that. For now, what we need to do is let the legal system work. We have a very strong case that has been in the making for months now. We all knew that this day was coming, so preparations were made and have now been implemented. The time for phone calls and writing has passed. The judge wants all sides to calm down and that is what I am asking all of you to do. It will do no good to aggravate the legal system when we aren’t losing anything. The monuments still are where they have always been. What we will need is financial help. Like the doctor said when Lincoln was born, “This is gonna get ugly.” It is also going to be expensive. The plaintiffs, of which the Beauregard Camp No.130 is one, have raised money for legal fees and the Heritage Defense Fund has helped so that we are even money with the attorneys for now. That won’t last. Please send whatever you can because come January the fight will be on. Gentlemen, I know that you all want to storm the gates but please let the people who have handled this awful situation since August continue to do so. They have all proven to be quite competent. I want to thank the P.G.T. Beauregard camp for taking the lead in this. I also thank CIC Kelly Barrow and the GEC for their leadership and support. Thanks to all of you. Keep praying for justice. 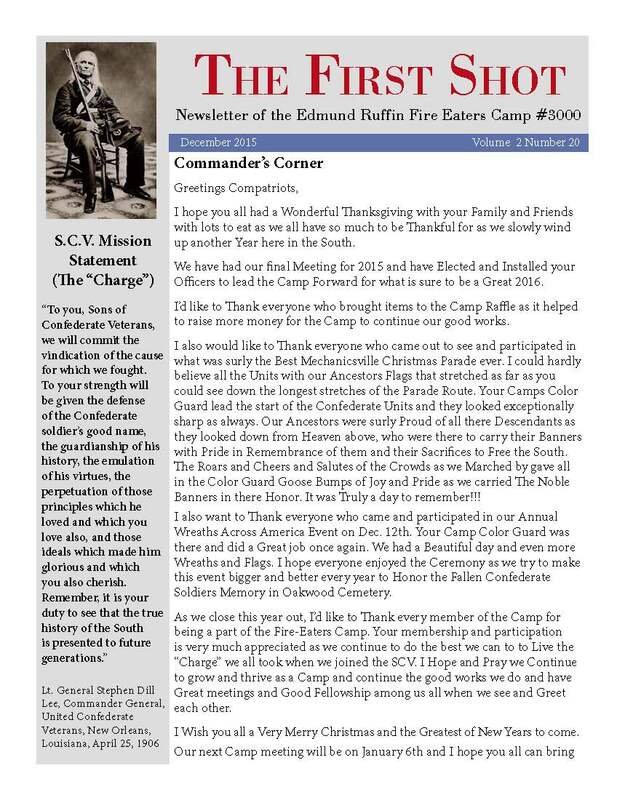 TODAY ONLY, Sunday December 6th, the Sons of Confederate Veterans are offering discounts on Lifetime membership. This is available to all members in good standing. You will continue to be responsible for Camp and State dues. The details can be found on our Facebook page or online. Online sign up is required and all monies need to be sent to Sons of Confederate Veterans, P.O. Box 59, Columbia,Tn. 38402 or use Paypal. Hope to see everyone at the Mechanicsville Christmas Parade today. 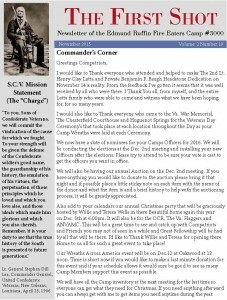 The November edition of The First Shot is available for download here.